The Museum reopened in July 2003 after a major redevelopment. Providing level access to the reception area and shop and a lift to all levels, a new workshop and display space and improved shop and refreshment facilities. Chertsey Museum is located in the historic town of Chertsey in Surrey. The town is famous as the site of the medieval Chertsey Abbey and has some of the best preserved Georgian architecture in the County. The River Thames and Meads meadow are only a mile or so from the town centre, with its antique shops and historic pubs. It is situated only a few miles from Windsor. 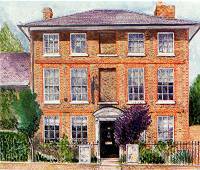 You'll find Chertsey Museum in "The Cedars", a Grade II listed Regency town house. The museum has many hands-on exhibits to help visitors explore the history of the area. Its collection includes a Viking Sword from the 10th Century, and other items of national importance. You can also see medieval tiles that used to decorate Chertsey Abbey, as well as many interesting and historic costumes from the Olive Matthews Trust. Olive Matthews (1889-1979) grew up in Camden, London where her interest in costume began and where she started amassing her collection as a small child. She became a keen and knowledgeable collector building up an impressive array of 18th and 19th century clothing and accessories. With limited storage space, she particularly concentrated on gathering small decorative items and acquired shoe buckles, beadwork purses, gloves, lace work and embroidery. Olive purchased the Cedars as the site for the new Museum in 1972 and working with the local Council agreed that the Museum would preserve, display and care for both the costume and the existing local history collections. Building on the original costume collection which focuses on the period between 1750 - 1830, items have been steadily acquired over the years and it now extends to the present day. Family Activities.The Runnymede branch of the Young Archaeologist Club meets at the Museum on the 3rd Saturday of the month. For children aged 6 - 16 years. A regular Museum Club and summer events are held for children aged 6-12 years, offering fun and practical workshop activities. Museum Monkeys, an under 5s club, meets on the third Friday of the month for sing-a-long, storytelling and craft fun. For further details please telephone. Education. Museum visits, classroom talks and loan boxes are available to local schools. Our school affiliation scheme offers object handling sessions at the Museum and staff give talks and lectures at schools and to community groups. Please telephone for details. The Gift Shop. The Museum shop has a wide selection of gifts to suit everyone. The Friends of Chertsey Museum. Membership gives you invitations to openings and special events, keeps you up to date with our newsletter and provides opportunities to become more involved in the work of the Museum. Pick up a special Friends leaflet when you visit or ask for one by post. Disabled Visitors' Facilities. Level access to reception area, shop and garden, ramped access to ground floor displays and lift to other levels. A free parking space is available for vehicles displaying a valid badge. For further details please telephone. Rail: From Waterloo via Staines or Weybridge. Museum 15 minutes from station. Buses: 58, 431, 436, 437, 446, 551, 557 & 562. Car: M25 (junction 11), A320 from Staines or Woking/Guildford, and B375 from Kingston. Street parking or town public car park.